The gas distribution manifold system is needed to deliver different gas species from the Tritium Plant to the vacuum vessel. Prototype junction configurations have been produced to test manufacturability and assembly feasibility. The final design review of the gas distribution manifold system, part of ITER's gas injection system, was held from 8 to 10 December 2015 in Chengdu, China. More than 40 participants attended the review either on-site or remotely, including 13 panel members and participants from the ITER Organization, the Chinese Domestic Agency, and the contracting institute Southwestern Institute of Physics. The gas injection system in ITER is responsible for the "initial fill" of the vacuum chamber prior to plasma initiation; for puffing gas into the chamber during the ramp-up phase; for controlling plasma density during the flattop of plasma burn; and for protecting the divertor targets from discharges by injecting impurity gases. In order to service the pellet injection, gas fuelling, neutral beam and disruption mitigation systems, different gas species from the Tritium Plant (hydrogenic species, helium, and the impurity gases argon, neon and nitrogen) will be delivered via a gas distribution manifold to gas valve boxes located in the vacuum vessels ports. According to the ITER machine assembly schedule, this gas distribution manifold system is expected on site before the rest of the gas injection system; for this reason, a separate design review was organized. 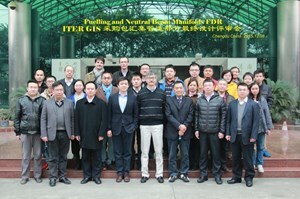 The three-day review took place in December in China with participants from the ITER Organization, the Chinese Domestic Agency, and the contracting institute Southwestern Institute of Physics. The manifold system consists of six gas supply lines and one evacuation line enclosed in a guard pipe for safe tritium handling. 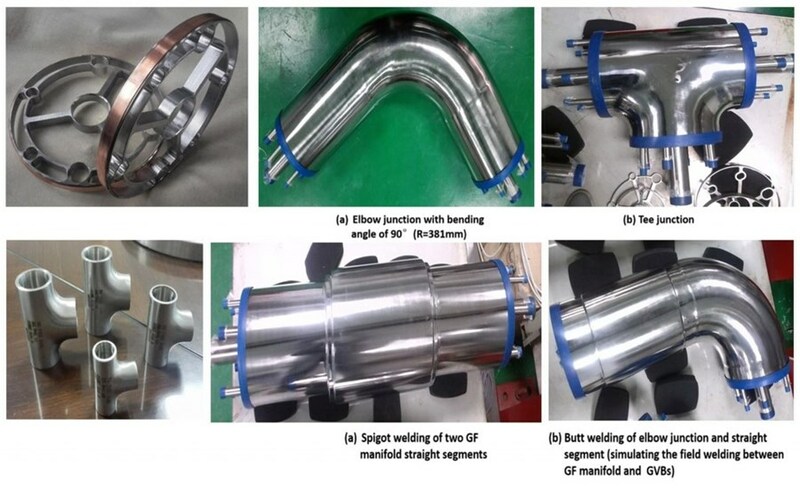 The main design challenge has been to avoid the interference of pipe junctions in vertical and horizontal directions, while taking into account the limited available space along the manifold route and the feasibility of assembly and maintenance. During the optimization process, up to four junction configurations were designed for each type of gas valve box. Prototypes of the different elements of the gas distribution manifold system have been produced to test manufacturability and assembly feasibility, and to allow for further optimization. Prof. Wang Yan, the chairman of the review panel, confirmed the suitability of the design and thanked the manifold team members for their hard work and effort. Based on feedback from the review, the focus will now be to perfect the design and ensure a smooth transition from the final design phase to the manufacturing readiness review phase.